My computer is dying a slow and painful death. The CD drive pops out to say hello when it feels like it and as of a few minutes ago, it erased some pictures from a disc that I really, really wanted to use in this post. Not good for a computer just on 3 years old, bit o plastic crap. 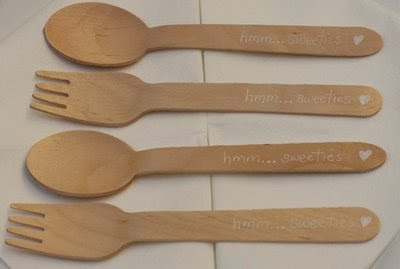 Last weekend I collaborated on a dessert buffet for my friend's baby shower. My sister and I, aka - the maker(me), the baker (her), put together a lovely buffet. She baked and I made it pretty. As I can't show you photos of the whole shebang. Here goes..... So my sister baked a raspberry ripple baked cheesecake, vanilla cupcakes with buttercream and onesie/pram vanilla cookies. I baked a three tiered stand of mini caramel tarts with fresh cream. We also had little heart chocolates. I handcut paper collars for the three tiered stand. 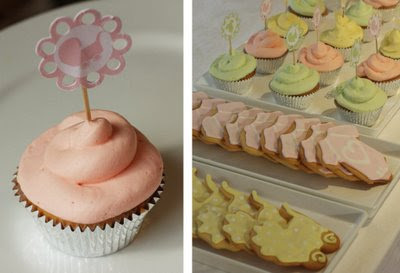 Designed and handcut some cupcakes toppers and little signs for each dessert. 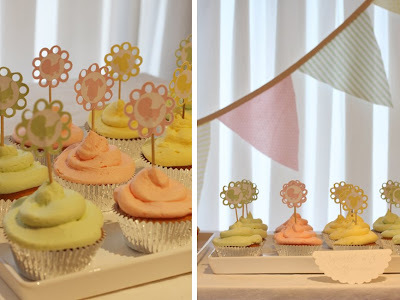 Wrote on bamboo forks and spoons and sewed some bunting to match our theme colours of green, yellow and pink. The table when it was finished also had a lovely little posy of pink and white roses. An absolutely outstanding celebratory shebang! Well done to you both was a terrific day and she was clearly chuffed. You are both so clever. ...love it..... you guys rock! Incredible! Definitely for the inspiration file.